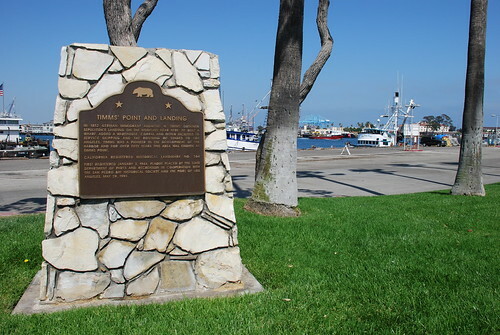 Timms’ Landing in San Pedro was the first Port of Los Angeles. However, any hint of the former landing and wharf is long gone, and not just in terms of structures, either. The very formation of the land and water has been altered to the point of unrecognizability for a century. German-born Augustus W. Timms started up a goat ranch on Santa Catalina Island after serving in the Mexican War (the veteran Timms marched in L.A.’s first July 4th parade, in 1876). He built a small landing on the island, which became known as Timms’ Cove/Timms’ Landing (later known as Avalon). California State Library That's Deadman's Island in the background. 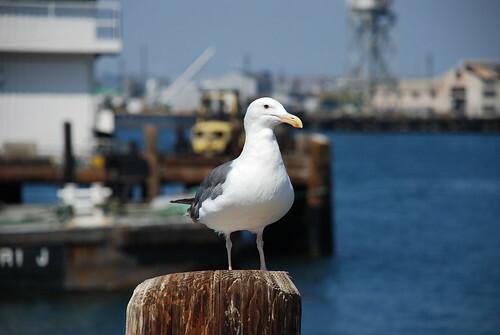 Back on the mainland, in 1852 or 1853, Timms bought and developed the old Diego Sepulveda wharf and surrounding area. The approximate location of Timms’ Point and Landing today is where 14th to 16th Streets would be if they’d be extended to the wharf at Ports o’ Call. (However, the 1993 California State Landmark monument, shown at the top of the post, is on Sampson Way down by 22nd Street.) Upon this point, Timms towed the hulls of a pair of wrecked ships’ hulls, using the deck houses to live in. His extending and improving Sepulveda’s Landing for shipping and receiving, coupled with his running stages to L.A., made him a chief rival of “The Father of the Los Angeles Harbor”, Phineas Banning. Timms also started one of the world’s largest lumber companies, selling out to Tomlinson & Company in 1865. Augustus W. Timms was a developer, and he continued to build up the area. His development included a two-story mansion, a hotel and bathhouse, a warehouse, a store, a corral, and a couple of houses. (The hotel was standing as late as 1930, having been moved to 4th Street between Mesa and Palos Verdes Streets.) Timms’ Point became a popular beach resort, known for its terrific clam hunting. 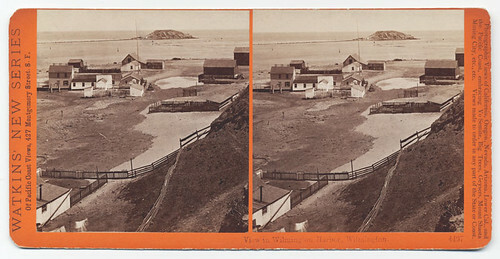 A later shot of Timms Landing, with Point Fermin and the Outer Harbor, from the U.S.C. Libraries Digital Archive. 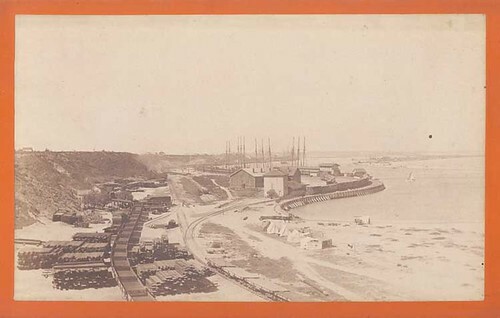 In the 1871, a jetty was built from Timms’ Point southeast to about 600 feet from the earlier built east jetty connecting Rattlesnake (i.e. Terminal) and Deadman’s (dredged away in the late 1920s) Islands. San Pedro really began to boom in the 1880s after the Los Angeles & San Pedro Railway was extended to Timms’ Landing. I'm standing, looking NNE, about where 18th Street would finish if it didn't end back on South Crescent Street. 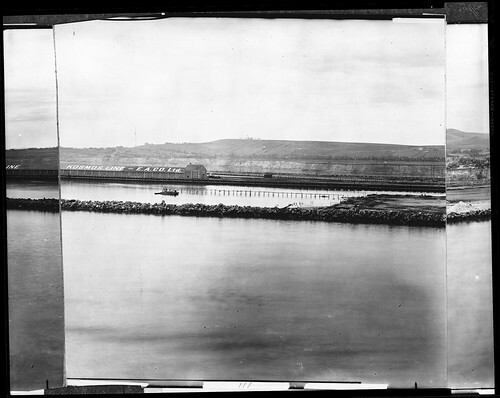 By 1906/1907, the Southern Pacific owned Timms’ Point, dredging the three slips there to thirty-feet deep each. Afterwards, the landing became known as the Southern Pacific Railroad Slip, and, later, Fishermen’s Slip. 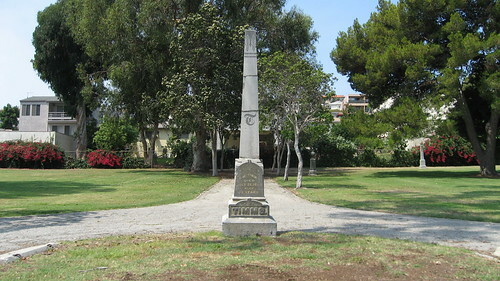 Augustus W. Timms is also to be remembered for donating, in 1888, the three acres of land for San Pedro Cemetery (now Harbor View Memorial Park) to the township of San Pedro. He died and was buried there that same year (I mean he was buried there the same year he donated the land, not the same year he died, although I’m sure that was the case, too). 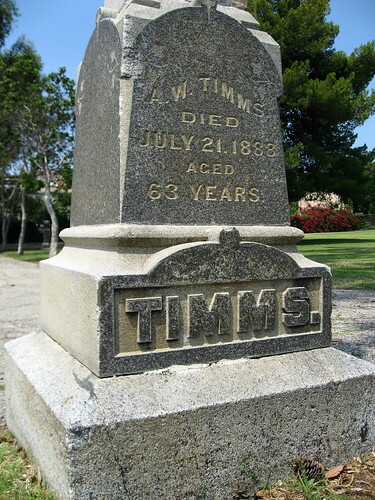 Timms’s monument stands in the center of the cemetery today. What is the story behind Deadman's Island? I remember it being mentioned in Dana's "Two Years Before the Mast" (I think he spelled it "Dead Man's Island) and that there was a tradition of burying the dead there, but I don't recall the complete story. In San Pedro Bay, Joe McKinzie writes "During the Battle of Dominguez Ranch in October 1846, several Americans were killed and buried on a small Island [sic] in the harbor of San Pedro, just south of Rattlesnake Island (now Terminal Island)." The island became known as Dead Man's Island. The info From Wikipedia, the free encyclopedia, is amazing. I, too, have often heard of Rattlesnake & Deadman's Islands. I assumed that Rattlesnake was the portion of Terminal Island near Wilmington, and Deadman's was the portion of Terminal Island near the Coast Guard Station & Prison. Wikipedea says: Deadman's Island (alternately written as Dead Man's Island) was one of two islands near San Pedro, CA in the 19th century. Deadman's Island was dredged away in 1928 as part of a harbor development effort. A whaling station existed on the island from 1860/61 to 1866. The men from the station caught Gray Whales as they migrated past Point Fermin from late December to early April. Rattlesnake Island, the other islet in the area, became Terminal Island. Another Website regarding Rancho San Pedro, The Historic Adobes of Los Angeles references your comment on the Battle of Dominguez Ranch during the 1846 Mexican/American war: The American dead were buried on a small island in the harbor...Posing a threat to ship navigation, the island was dredged away in 1921. 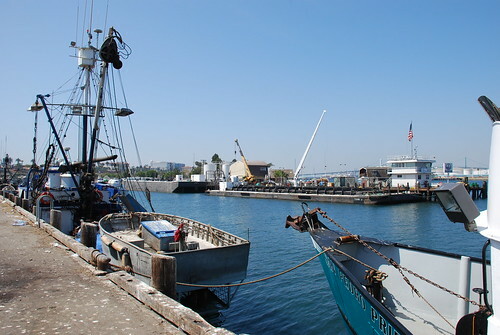 The dry-dock area north of coast guard base on Terminal Island is the site of Dead Man's Island. I also found a historical 1905 map of San Pedro. I’ll e-mail it to you. I think it shows Deadman’s Island at the harbor entrance. There is also a close up showing the Dodson Residence (Monument #147) on 7th Street. Thanks, Robert. I've seen that 1905 map. I've even seen it for sale on T-shirts. If that's Timms' Point at the end of 14th Street (and I reckon it is), the area below it sure has change drastically in the past century, with many of the changes happening right after the map was made. You would think that they would have placed the marker on Timms Way, San Pedro, CA 90731. I've been reading about Timms'Landing and I saw that you have a 1905 map of San Pedro. Any way that you can email me a copy? Sorry, zmpk34, I don't have a copy. Just google '1905 map San Pedro' and you'll find the same image I referenced. The first dead man on Dead Man's Island was a British captain who was rumored to have been poisoned while in port. Dana hints to this rumor in Two Years before the mast. The 6 other men were the Marines from the Battle of Rancho Dominguez.